rodeasdown.com.au – Bi-amping and bi-wiring: Just buy wire. I mentioned bi-wiring and bi-amping in a recent speaker review and I’ve had a slew of messages all centred around two questions; ‘how do you do it’ and ‘does it work’. But first off, both of these things are only possible with speakers that have two separate sets of binding posts at the rear, one for the high range drivers and a second for the low range. Usually these speakers come out of the box with the two binding posts connected by a removable busbar which lets you power all the drivers in the speaker through one set of binding posts, which is what the great majority of people do. 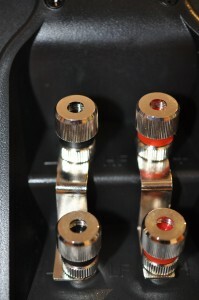 To bi-amp you remove the busbar and connect one amplifier to the top binding posts to drive the high range, and a second amp to the bottom ones to power the lows. So your drivers get lots more power – and drivers love power – and can therefore handle difficult passages of music far more easily, for more accuracy, more depth and more presence. I’ve never been able to afford bi-amping but I’ve listened to plenty of bi-amped systems and generally the changes are extremely subtle, but a bit smoother and more luscious at higher volumes. And yes, when the cannons roll into the 1812 Overture or the guitars crash in during the opening minutes of US Forces by the Oils you’ll note the extra horsepower. Bi-amping is largely the province of professional installers who know how to set it up and how to get the volume levels right between the various amplifiers. There are multi-channel amplifiers that can be set up to drive high and low ranges separately. You’re venturing into esoteric territory here and may need help. And lots of money. Bi-wiring is much cheaper. Again you remove the busbar between the two sets of binding posts and run separate cables from the amplifier to each of them. 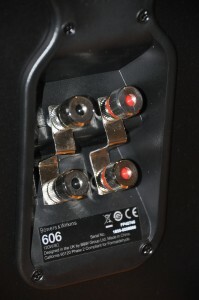 Both cables are connected to the same speaker output of the one amplifier, but your high and low range drivers are isolated from one another from that point. As I mentioned I’ve tried this and I could hear no difference, and plenty of people who have tried it have had the same experience. I guess this is why the ‘buy-wiring’ comment comes up. But there are enough people I’ve spoken to who believe they have noticed an improvement to suggest that with some systems playing for listeners with particularly good ears there is a beneficial effect. These people mostly talk about a clearer, airier mid-range, and it’s the mid-range in which most instruments spend most of their time. Human voices also fall mostly in the mids, so if you’re into opera or especially female vocal and you have speakers that can be bi-wired it’s probably worth a try. But the true believers say it should only be done with high quality (read expensive) cables, and that starts an entirely different debate about whether cables make a difference. The people who believe most passionately that they do often turn out to be the people who sell cable. Maybe you’re used to spending $10 a metre, maybe even $20. Perhaps you should now start thinking around $100.